Cyber Crime accused (from left to right) Deo Soka, Leila Sinare, Monica Soka and Godfrey Soka at the Kisutu court. Four youth were Friday arraigned in court for misleading public through a WhatsApp social media Group. Youth have been warned to make good use of the social media following arraignment of four other people accused of cyber related offences at the Kisutu Resident Magistrate’s Court. The remarks were made by the Senior Assistant Commissioner of Police (SACP) Charles Kenyela at the Kisutu premises after the trial of the four culprits of Cyber Crime Act. "He said no one who offends the cyber laws will be spared." Kenyela said people think they can hide behind their keyboards and commit cyber offences without getting noticed. Security forces are always on the alert to make sure all law offenders are acted accordingly. 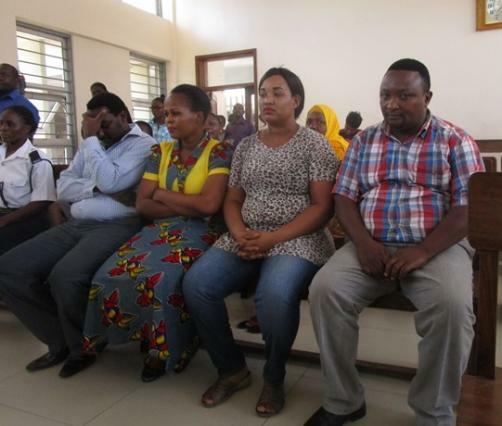 Earlier, four people including three relatives Leila Constantine Sinare, 36, Godfrey Edward Soka, 45,Deo Edmund Soka, 40 and Monica Gaspary Soka, 32 were arraigned at Kisutu Court charged with two counts of publication of false information through WhatsApp. Before the Senior Resident Magistrate Cyprian Mkeha, the Senior State Attorney Wankyo Saimon said the defendants committed the offences on diverse dates between October 20 and 30, this year with intent to mislead the public during Tanzania General Elections. The accused are said to have published a voice note through the WhatsApp social media by Chatting Group namely SOKA GROUP, to wit ‘dear fellows in political forum, there is no need for wishing each other with nice election, our country has already plunged into chaos and anytime soon it will turn into a war zone. It is true it has entered into war because 3 boxes full of fake votes have been captured in Vunjo Constituency; we have captured 3 other boxes at Moshi Town, 6 in Ilemela and 12 boxes in Hanang. All accused pleaded not guilty. Prosecution said investigation of the matter is incomplete. The defendants are due in court on December 3, this year for another mention of the case.